The study of garden history can be inadvertently elitist, simply because the documentation of gardens of the wealthy is comparatively so extensive. 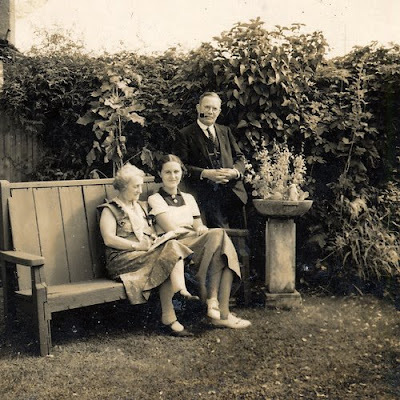 Other than the odd photos or family accounts that make their way into archives, there are few sources for records of the gardens of a more average sort; those by people not wealthy or significant enough to have their gardens documented outside the family. So the flickr photoset 'Vintage Gardens and Gardeners', administered by lovedaylemon, is an invaluable garden history asset. Period books and magazine show what advice was being given as to garden design, but photos are the essential evidence for how gardens were actually decorated, planted and used. The photoset is a wonderful record of tools and implements, dress and manner, not just how gardens were planted but how they were used. And the faces, beaming out from their beautiful and personal landscapes, which are clearly treasured, make me teary. I can't say enough about the value of this archive. If you have family or found photos of vintage gardens and gardeners, I would urge you to post them with this flickr set (include as much information about location and date as you know). Let them become a part of garden history. Garden historians everywhere will thank you! 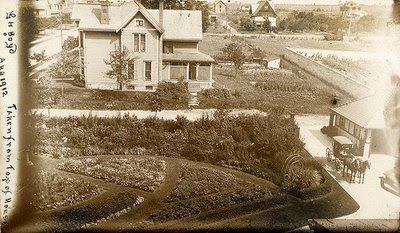 From the top, an elaborate Victorian parterre in a style often associated with a much grander house than that pictured. Families in what was probably their favorite place in the garden: a woven willow summerhouse in the first photo and a sunny bench in the second. And finally, a topiaric Adam and Eve...note the apple in Eve's hand and the serpent rearing his ugly head. I wonder if they were inspired by Pope's description? Great pictures. I wish the Museum of Garden History would put their's online. I love stuff like this. 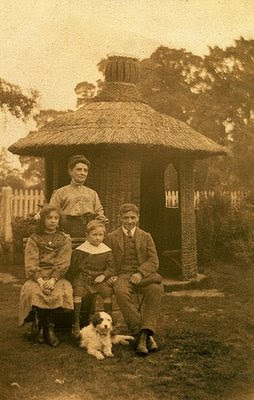 I've finished, as one of dissertations, a poetry collection based on 2 centuries of family photos. I'm going to go chekc this archive out ASAP. Thanks. Fantastic; it is so true that so much of garden history has been about big gardens and big names. Thanks for the tip; I would not have found this archive otherwise! Thank you so much for this post! 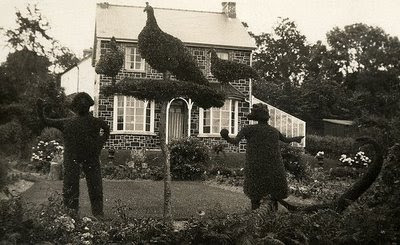 I'm just doing some initial investigation into local garden history and this give me some added scope for ideas and inspiration! Fascinating! What an interesting blog you have. And such an interesting area of research. I've enjoyed looking this over. I love the Dumbarten and Oaks garden in D.C., have you been? I like the starting point here hugely, and am glad to hear that the archive exists. During Black History Month here in the States, I discovered a couple of recent books about traditional gardens kept by African-Americans in the south--not a particularly wealthy group, as you can imagine. These books are being written at the last possible moment, before the people who can remember them are all dead. As Simon and Garfunkle sang, "Preserve your memories--they're all that's left you." Loving Your blog! Anyone who knows anything about culture should be impressed with your degree. It's a cool subject. We've recently set up the world's first 'virtual' gardening school - to help people from all over the world learn more about gardening. You've prompted me to think more on what we should do on the history side.